History is being made on how the world is responding to vaccination. Even long-term health professionals are refusing to vaccinate themselves in the face of continued injury and death being caused by the practice. 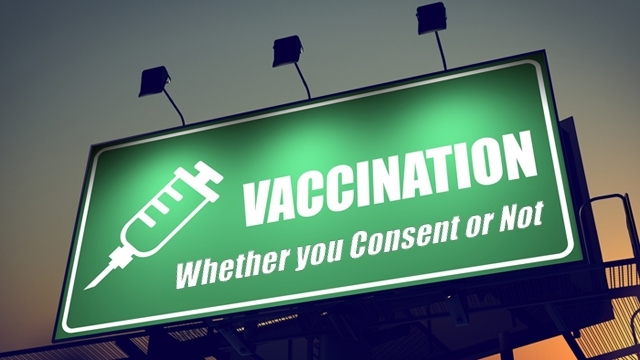 Almost half of healthcare professionals are now refusing to vaccinate and children’s uptake for HPV, influenza, chicken pox and many other vaccines are reaching historic lows as the awakening spans across the planet. One thing is for sure–those who have stopped vaccinating will never start vaccinating again. So the challenge for the pharmaceutical industrial complex is now aggressively shifting to holding on to the remaining vaccinators before they convert to the anti-vaccine position. How will they do this? Fear of course. There’s a consequence to this awakening. As more people become informed and pull away from the clutches of fear, anxiety and control that accompanies vaccination, more public health and government policy will enforce their position through aggression and threats. That alone is a clear indication of which stance holds true merit and which one doesn’t.Bullies don’t like being confronted by the truth, but the truth doesn’t care. That’s why the anti-vaccine position roots itself largely from a non-violent, passive and informed approach. They are mostly indifferent about vaccinators injecting themselves and their children and feel if they must continue the practice, they have the right to their opinion. On the other hand, most in the pro-vaccination camp are very angry, antagonistic and don’t believe anybody who disagrees with them has that right. Anti-vaccine proponents are a risk to us all and they must be imprisoned or exiled.The future of vaccination, if it has a future, will not be one in compliance through force. The imposition of mandatory vaccination (or its illusion) is perhaps the biggest mistake that public health policy and government is currently pursuing. It is working against them. It is an attempt to desperately derail growing numbers of an informed population and it will accelerate the demise of vaccination as we know it.In the next year, there will be a massive, highly coordinated and sensationalized propaganda on behalf of pharmaceutical companies, who will use the media and public health agencies to strike fear in those thinking about not vaccinating there children. The campaign has already started as evident in measles scare heavily covered by the mainstream media.Schools will also be changing their policies. Not only are public health entities habitually and deliberately failing to inform the public of their right to refuse vaccines in both school and work settings, but they are working towards mandatory vaccination protocols which will allow officials to conduct childhood vaccinations without any parental consent at all. The reason is simple. The pharmaceutical companies no longer dominate the spectrum of knowledge on vaccination. The gig is up. People are no longer fooled by the fraudulent studies funded by drug companies, the hidden CDC documents now exposed, the fabrications and plots by government on flu vaccines, and the lack of safety studies in almost any area of vaccination. Big Pharma now has statistical verification that vaccine exemptions rates are at all time highs while vaccine uptake is at all-time lows. They have the data and they’re desperately trying to reverse the trend. State legislatures are now dealing with a rash of legislation to tighten vaccination rules in reaction to the targeted media attack against the anti-vaccination movement that started with the coordinated Disneyland measles outbreak. The media outcry was designed to focus on parents who choose not to vaccinate their children. With Disneyland scare, it’s now been established at least half of the Disneyland children who allegedly caught measles WERE vaccinated. In California, a group of state legislators rammed through legislation to eliminate the state’s “personal belief” exemption, which includes the religious exemption, from the state’s vaccination laws. The end of exemption laws are just one part of the equation, but there are also calls to imprison parents who don’t comply and revoke the licenses of Doctors who don’t comply with vaccine promotion. Biased opinion pieces such as this one in the Washington Post claims that any doctor who opposes vaccination should have their license revoked. The author calls the anti-vaccine stance based on nothing more than anecdote, myth, hearsay, rumor, ideology and fraud. The problem is they either don’t read or listen to the hundreds of scientific studies which confirm that vaccination and associated toxins are dangerous. They want to consider counseling against vaccination as misconduct for Physicians. The claim doctors are distorting what patients need to know to preserve their health or that of their children and they have “crossed a bright red line”. Do you see the problem? It’s an imposition of ideals based on misinterpretations, flawed science and far reaching conclusions that they call fact. They are not fact. They are anything but fact. The only fact is that we don’t know how safe or dangerous vaccines really are. Officials at Queen’s University in Canada have now launched an investigation into claims that a health studies instructor has been teaching anti-vaccination materials in a first-year level course. They go as far as to state that “the tone of it is clearly skewed to ‘vaccine is bad,'” he said. “It’s got elements of truth to it, which make it slightly credible. But there are a lot of things in it which are not correct.” The question is who can make the judgement that it is correct? USA Today columnist Alex Berezow headlines an aggressive pro-vaccine rant stating that “Parents who do not vaccinate their children should go to jail.” His position is that no matter how toxic the vaccine ingredients really are, parents who do not comply with vaccination should be thrown in prison. The message is clear: any parents who might have genuine personal and family health concerns regarding risky vaccines, are “putting the public safety at risk and therefore must comply”. In the wake of this crisis, US media are currently promoting a new class of laws that will eliminate a parent and student’s ability to obtain a ‘waiver’ for mandatory vaccinations. In other words, if you do not get all the vaccines which the state demands, then you will be breaking the law. Even Dr. Gregory Poland, one of the world’s most admired, most advanced thinkers in the field of vaccinology, has stated that the measles vaccine has failed. Dr. Poland often stressed that a more fundamental problem stems from the vaccine being less effective in real life than predicted, with a too-high failure rate — between 2% and 10% don’t develop expected antibodies after receiving the recommended two shots. Because different people have different genetic makeups, the vaccine is simply a dud in many, failing to provide the protection they think they’ve acquired. 20 years ago, scientists working at the CDC’s National Center for Infectious Diseases, funded by the WHO and the National Vaccine Program, discovered something truly disturbing about the MMR vaccine: it leads to detectable measles infection in the vast majority of those who receive it. Yes, MMR vaccine can cause vaccine strain measles infection that looks just like measles. Plus, other common viral infections — like adenovirus infections — can look just like measles with rash, fever and conjunctivitis symptoms, and be misdiagnosed as measles UNLESS there is expensive RNA lab testing done to confirm that what looks like measles really is wild type measles. The National Vaccine Information Center has published an important document relevant to this topic titled “The Emerging Risks of Live Virus & Virus Vectored Vaccines: Vaccine Strain Virus Infection, Shedding & Transmission.” Pages 34-36 in the section on “Measles, Mumps, Rubella Viruses and Live Attenuated Measles, Mumps, Rubella Viruses” discuss evidence that the MMR vaccine can lead to measles infection and transmission. Pertussis whooping cough is a cyclical disease with natural increases that tend to occur every 4-5 years, no matter how high the vaccination rate is in a population using DTP or Tdap vaccines on a widespread basis. Whole cell DTP vaccines used in the U.S. from the 1950’s until the late 1990’s were estimated to be 63 to 94 percent effective and studies showed that vaccine-acquired immunity fell to about 40 percent after seven years. A study in Vaccine titled “What lied behind the low rates of vaccinations among nurses who treat infants?” is evidence of a growing resistance to vaccinating infants in the developed world. For one of the most unscientific vaccines in the history of vaccination, the HPV vaccine uptake is now headed below 50% for the first time since it’s introduction in 2006. A closer examination of the CDC’s National Center for Health Statistics (NCHS) figures shows that in 2001, there were only 257 deaths directly attributable to flu, and in only eighteen cases was the flu virus positively identified. Between 1979 and 2002, NCHS data show an average of 1,348 actual flu deaths per year–a mere 5.7% of the “new and improved” estimate. Do you want to live in world that takes away your right to refuse medical procedures that carry a risk of injury or death? In a world where we cannot prevent our own children from drug therapy others claim is safe? Are you ready to have all your rights violated in this new era of medical tyranny at the hands of those who want complete control over your mind and body? If you answered “no” to any of the above questions, now is the time to voice your opinion. Please comment below and share your voice. TLB recommends you visit Prevent Disease for more pertinent articles and information. I appreciate this article very much. I am interested in interviewing Dave Mihalovic. If you have any direct contact information, please forward to my email.